When Tara Met Blog: I voted! Having only voted in New York and Connecticut's machine booths before, I'm still not used to the paper ballots and filling out the dots. I kept making sure it was aligned write and I was putting the blotter in the right place. I think I did fine, but I kept double checking. Where are all the candidate signs in your picture? 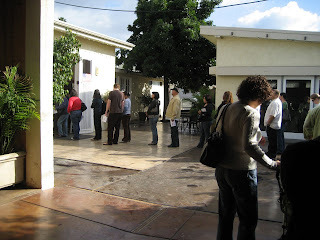 I had to walk a maze of them just to get to the door of my polling place. Must be because I live in a swing state. I can't wait to not be getting 3 calls every night!! !